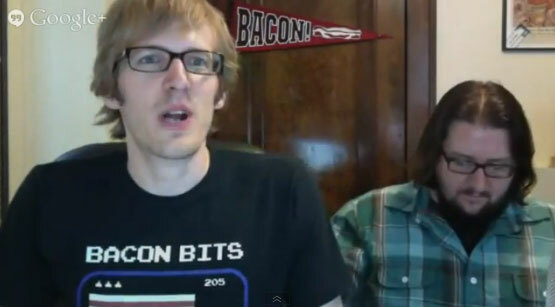 This was the first show of Bacon LIVE on Google Hangouts. We had a few glitches but learned a lot so next weeks show should be better. This was the frist time a lot of people heard Aaron Tuckers voice. For those that don’t know him, he is are only true fan. This show was recorded on Jun 12, 2013. We talked about, a bacon wedding, Richmond’s first Bacon Festival, Dunkin’ bacon donut sandwich, Chris P. Bacon gets a book deal, Bacon on Wheels, and a Deep Fried Doritos Locos Taco with bacon. Remember to watch the show live Wednesdays at 7pm ET. Visit BaconLIVE.com for more details about the show.